How to finish a basement bathroom: Mark the floor layout for the shower stall, toilet and sink. Cut the concrete slab floor to relocate and install the shower drain. This project is continued from How to Finish a Basement Bathroom – Part 1. See the series introduction for the project index. The next task is to decide where the bathroom fixtures – sink, toilet and shower stall will be installed. The builder had already roughed-in the plumbing so I didn’t have a lot of choices but it’s necessary to measure and mark the locations to check clearances and guide the work. I verified the toilet plumbing rough-in dimension (distance from the wall to the soil stack) because this is an essential measurement for ordering the right toilet. In my case, it was a standard 15 inch rough-in distance from the wall. I discovered that the builder placed the shower drain plumbing rough-in too close to the toilet soil stack, meaning the toilet would be too close to the shower. The shower drain will have to be relocated. The width of the shower stall is limited to 3 feet due to the placement of the soil stack and clearance for the toilet. The basement bathroom shower drain is off center and had to moved by several inches beyond the rim of the existing opening made by the home builder in the cement floor. A hammer drill and 1/2 inch masonry bit is used to drill weakening holes to chisel a knockout in the concrete slab floor to relocate the shower drain. After drilling several holes to weaken the concrete slab floor, a brick chisel and sledge hammer are used to make the remaining cuts and shape the sides. Be sure to wear your safety glasses because cement chips fly everywhere. The PVC pipe and shower drain base for a tile floor are glued together. The shower drain clamp ring, adjustable barrel and strainer are shown here. The shower drain flange (base unit glued to the PVC drain pipe) must be high enough above the concrete slab floor to be even with the primary mortar bed for the tile shower. I didn’t want to too shallow mortar bed so I installed the drain base about 1 to 1-1/2 inches above the concrete floor. The shower mortar bed will be installed and sloped to the match the drain, which allows for a good deal of height adjustment. The bathroom walls are painted a light blue color while there’s no worry about paint drips on the bare floor. The Wagner Paintmate roller is my favorite for painting walls. I didn’t paint the shower stall walls which were primed with white paint by the home builder because the shower walls will be covered with cement backer board and tile. The shower pan and mortar bed is built in How to Finish a Basement Bathroom – Part 3. I don’t understand why there is no trap for the shower drain. What prevents the “ode of sewage” in the bathroom? The builder installed a trap, it’s in the dirt. I verified a trap was there by seeing standing water in the pipe with a flashlight; running a flexible metal snake down the drain and “feeling” two turns; and lastly I accidentally dropped a screw down the drain and was able to retrieve it from the U bend with a magnet. There’s never been any sewer gas odor nor siphoning sounds from the drain that would indicate a problem with the trap. Thanks for ther great posts and pictures. I have a question. Did you fill foundation rock only or poured concrete on top of the foundation rock? I filled the hole with foundation rock in layers, tamping it down as along the way to fill all voids. Not too hard though – don’t want to break the PVC drain pipe. The foundation rock packs really well. The mortar bed for the shower pan provided the solid cap on the foundation rock. Notice the foundation rocks stops about 1 or 2 inches below the edge of the concrete floor in the photos to create a supporting “plug”. You are correct – the sewage basin air vent pipe must be connected to the outdoors. It’s easy enough to tap into the existing plumbing vent pipe in the attic by installing a Wye or Tee fitting, you’ll need to figure out a way to route the PVC vent pipe from the attic to the basement. Part 10 of the project series details the sewage basin plumbing vent pipe. Let me know if I didn’t fully answer your question. Yes, you have answered my question. Thank you for answering so quickly. I have one more question if you dont mind. The sewage basin have no previously cut holes in the side of it. I am assuming that I have to drill my own holes or did I get the wrong basin? My basin is a Parts 2 O brand. I looks like there are extra grommets for that purpose, that come with the lid. The sewage basin should have preformed inlets on the side for sewage line entrance. If there are two or more inlets, the inlets might be capped. This provides the installer with flexibility in the plumbing configuration by cutting open or both inlets. My basin has two inlet ports, both inlets were capped with an integral plastic covers. Since my basement bathroom has only one sewage line under the concrete slab, only one inlet was cut open and fitted with a grommet to seal the sewage line. Your Parts2O brand sewage basin should have a factory made inlet. Take a look at this Parts2O basin and read the Technical Specifications sheet towards the bottom of the page. An equivalent material is “Slag Sand” and “Paver Base“. Slag sand and paver base is an angular sharp material with various sized grains that packs very hard, much different than plain sand which has fine round grains. Check the local landscape supply stores that sell brick pavers and stone. Bob what waste is that you have used? I am looking for an untrapped shower waste which goes into 4 inch soil and that looks perfect. Where did you get it from and what make is it? It’s an Oatey shower drain for tile or marble shower bases with standard 2 inch PVC Schedule 40 drain pipe and elbows. I updated the project with high resolution photos and product links. Let me know if the new material answers your question. Very impressed with your post. I have been a contractor for about thirty years. It looks like you did an outstanding job. I have an existing drain. I am using the Schluter system and have found out that I need to cut a box out where the drain is and then cut the old pipe and then put a coupler over the 2in pipe fill in area around coupler to top and then proceed with installation. How do I cut a box out or basically an area big enough for coupler to be put in to install Schluter flange? Can I use your method above with a rotary hammer and bullpen bit making a square? Thanks in advance for taking my question. Very nice! I plan to tear out and remodel my master bath shower using the Schluter®-Shower System and KERDI-DRAIN. So you’re building the shower pan on a concrete slab floor and need a “Concrete Box Out Drain Preparation“, correct? i.e. Cut a concrete box hole in the concrete to install the Kerdi-Drain. The problem is cutting a new box shaped hole in the middle of the slab around the shower drain pipe. If you use the hammer drill & brick chisel method you’ll have to drill a lot of holes along the box hole perimeter and still have a big heavy block of concrete with the embedded drain pipe in the center. So you’ll have to drill more closely spaced holes around the drain pipe to free the concrete block from it. It definitely can be done this way but it’ll be slow hard work. What I’d do in this situation is rent a 12 inch electric concrete saw to cut the shower drain box hole in the concrete slab. The saw at the previous link has a dust vacuum and operates on 120 volt household electricity. Mark a 12 inch box on the slab floor, make four cuts at the box sides, then interior cuts about 1 inch apart to break out the slab with a pry bar and 3lb hammer. The concrete saw blade will leave a rounded piece at the box corners and that’s OK. Make a square cut around the drain pipe not closer than 1/2 inch so as not to damage the pipe. It should be easy enough to crack the small slab “core” surrounding the pipe once the outer portions of the slab are removed. Note that you should make all concrete saw cuts first and only then break out the slab. Doing it this way means you’ll always have a flat base to support the saw. Step 1 – Mark the box on the concrete, then slice the concrete into sections. Step 2 – Break out the concrete slices with a pry bar and hammer. Step 3 – Continue until all the concrete is removed to make the drain box. Step 4 – Hammer drill weakening holes if needed to remove any extra slab. I doubt you’ll need to do this because it doesn’t matter if the box hole corners are rounded at the bottom due to the shape of the saw blade. Just be careful when chiseling away the concrete at the drain pipe. Now you can install the coupler and Kerdi-Drain, then fill the box hole with cement. Did the plumber cut the concrete slab floor to install the shower drain and pipe? Or did the home builder rough in the shower drain like mine? The fine foundation rock that I used to fill in the slab rough opening doesn’t seal out ground water. It’s only for supporting the mortar shower pan. 1. Direct the rain water away from foundation. Run the gutter downspouts into corrugated drain pipe buried in the ground which empties some distance away from the house. Landscaping companies do this type of work all the time. 2. Install a basement sump pump. 3. Install foundation drains along the house footing. This typically requires heavy equipment and is expensive. My basement is stubbed for a shower, but all I see in the hole is a horizontal 2″ capped pipe. How do I tell if there is a p-trap some where below? Inspect the drain pipe with a snake scope camera (endoscope) with a light like this model on Amazon.com. Let me know if the builder installed a P-trap. It would be the right thing to do with pipe stub set in the concrete slab. I recently installed a fiberglass shower on a slab in my steel building. I didn’t fill in the boxed out area around the drain pipe. I really couldn’t see any reason for doing that as my slab is high and dry. Is this a problem ? I filled-in the drain rough opening in the floor slab to support the mortar base. For a fiberglass shower pan there’s a small risk the pan will flex under a person’s weight, working the strainer body loose over time causing a leak. I believe this is why my upstairs fiberglass shower drain leaked. If your drain is located near the edge of the pan it’s less likely to be problem than if the drain is in the middle of the pan. My neighbors have asked me to tile their basement shower. It has a drain going into the slab floor, which was painted but is deteriorating, and until recently had painted plywood walls. Their budget is small and I’m wondering if I can do the following, as opposed to moving the drain and building a pan; clean up and waterproof (Redgard) the concrete floor, extend the drain an inch or so (with some sort of drain extender? ), hang cement board on the studs and Redgard, then tile. My grandparent’s home built in 1960’s had a basement shower. It was a simple drain in the concrete floor with a wrap-around shower curtain. 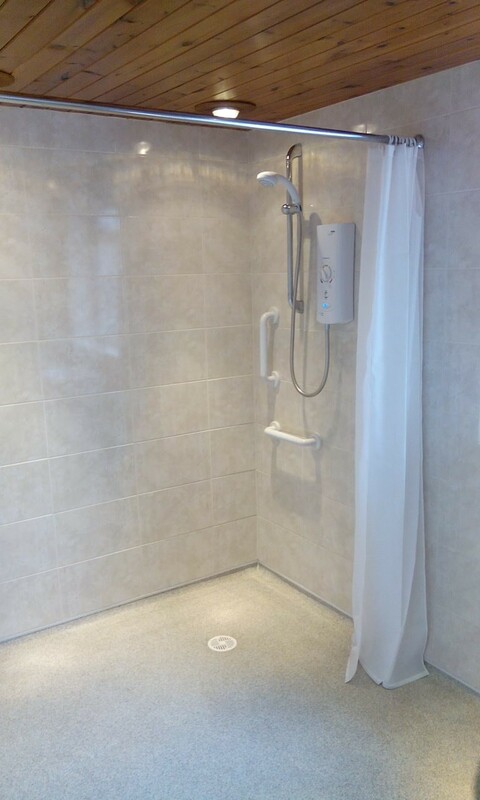 Take a look at “wet room showers“, which are popular in Europe. See “HOW TO INSTALL AND WATERPROOF A WETBASE WETROOM SHOWER TRAY IN A CONCRETE FLOOR” by Wetrooms Online. I’ve not tried Redgard but it may work. The Aquaseal Waterproof Tanking kit (https://www.amazon.co.uk/Aquaseal-Wet-Room-System-Waterproofing/dp/B006FTESLW) is preferable, but may be difficult to find in the USA. Visit a local tile supply warehouse and ask for their equivalent product.